Currently, retiring overseas is a growing trend among Westerners. There are several reasons that explain it. But undoubtedly, in most cases the one that ends up weighing more is the money. Less income, but more free time. So, retire in a country that offers you the same facilities and comforts as at home, but where for the same price you can have a standard of living twice as high, could be a great decision. Besides intensifying your lifestyle without ruining your budget. Retiring abroad can provide you an opportunity to have new experiences, know new cultures, change the lifestyle and enjoy more pleasant climates. And certainly, the possibility to keep in touch with family through new communication technologies and cheaper international transport have been key factors for the growing number of people who once stop working, take their bags and move abroad. 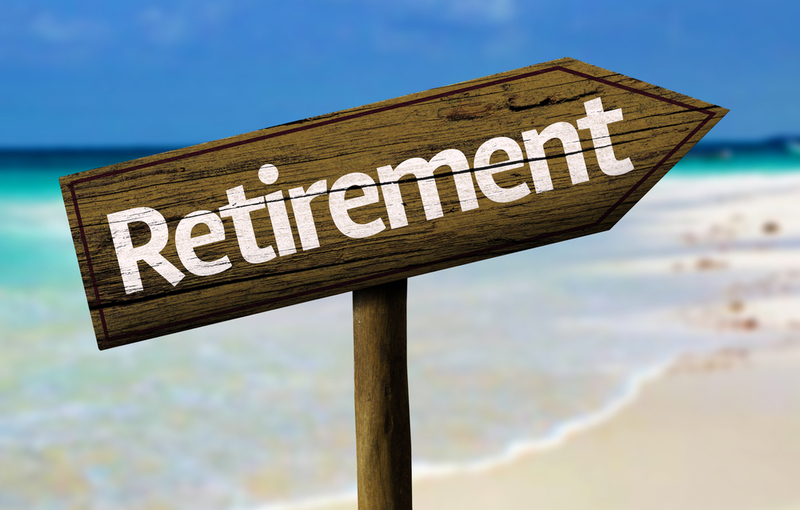 Retiring abroad requires a well-studied financial planning. In addition to the cost of living, it is important to consider the countries with the most beneficial retirement visa programs and the requirements to qualify to them. Find out whether or not you can receive Social Security benefits from your country abroad. And taxes. Your residence status for tax purposes, the type of pension and your home country tax law. Retirement country foreign-source income taxes, tax treaties and how they affect in terms of pensions, annuities or other income. Next, we’ll cover the key aspects of those we think are some of the best countries to retire in Europe, The Caribbean, South America, and Asia. Considering the climate, retirement visa programs available, safety, medical services, language, expat community, cost of living and taxes. From undeveloped islands with white sand beaches, crystal clear water and tropical forests like Pulau Kecil and Pulau Tioman. Colonial cities like Georgetown (Pulau Penang). To the hustle and bustle of the modern skyscrapers of Kuala Lumpur. Culturally, Malaysia is an exciting country. Together with the native Malay culture, the Chinese and the Indian live harmoniously. With a strong British colonial influence that is reflected mainly in architecture, manners, law, religion and language. English is an official language and many of its inhabitants speak it fluently. The religious variety is also visible. In the same street, you can find a mosque, a Chinese Taoist temple, a Buddhist temple, a Hindu temple and a Christian church. This cultural mix also makes it one of the most varied gastronomic offerings in the world. Malaysia My Second Home. This is the name of the retirement program that the Malaysian government launched a few years ago. The program has been a success and is still in force. It offers a multiple entry visa for 10 years, renewable. Have a monthly income of at least MYR 10,000 (≈ USD 2,250). Make a fixed deposit in a Malaysian bank of MYR 300,000 (≈ USD 67,500), which can be withdrawn half to buy a house, purchase health insurance or pay children’s education. After two years, part of the deposit may be withdrawn to use the car purchase concession. As long as a minimum balance of MYR 150,000 (≈ USD 33,707) is maintained during the entire stay in Malaysia under the program. Have liquid assets of at least MYR 350,000 (≈ USD 78,600). These liquid assets can be cash, bonds or shares. Make a fixed deposit in a Malaysian bank of MYR 150,000 (≈ USD 33,707), from which MYR 50,000 may be withdrawn to buy a home, purchase health insurance or children’s education. After two years, part of the deposit may be withdrawn to use the car purchase concession. As long as a minimum balance of MYR 100,000 (≈ USD 22,500) is maintained during the entire stay in Malaysia under the program. Applicants who have a monthly Government pension above MYR 10,000 (≈ USD 2,250) will not need to meet this requirement. Requirements for individuals who have purchased a house / s for a total value of at least MYR 1m (≈ USD 225,000). Have purchased the property within 5 years prior to the visa application. Make a fixed deposit in a Malaysian bank account of MYR 150,000 (≈ USD 33,707) if the applicant is under 50, or MYR 100,000 (≈ USD 22,500) if he/she is equal or older than 50. A Malaysian sponsor is required to support the application and place a personal bond up to MYR 2,000 (≈ USD 450) before the visa is issued. Have medical insurance from any insurance company that is valid in Malaysia. Senior applicants who are denied coverage because of their age are exempt from this requirement. Undergo a medical examination of any private hospital or clinic registered in Malaysia. Police clearance certificate from the country of origin to prove that the applicant has no criminal record. MM2H visa holders who are 50 years of age or older and possess specialized skills could work up to 20 hours per week in certain sectors. Under the approval of a committee. They could also establish and invest in a business, as long as they are not actively involved in the day-to-day running of the business. Visa holders may purchase property without restriction. Provided that the minimum price established for foreigners in the state where they make the purchase is applied. Usually, the minimum price is MYR 1m, but there are states like Penang with a lower minimum. Buyers must receive state approval, which can take up to six months. They may also apply for a bank loan. Local banks will require proof of repayment capability since repayment is normally required when the borrower turns 65-70. Other benefits include the duty-free, excise and sales-tax-free import of an automobile owned by the visa holder requesting an approved permit (AP). As long as the car has been purchased prior to the date of the application and it is carried out within a period not exceeding 6 months after the issuance of the visa and import within a maximum period of 2 years. Visa holders can also purchase a tax-free Malaysian car during the first year of visa. Applicants may include in the application to their dependents. It is important to note that the visa under the MM2H program does not qualify for a permanent residence permit. Ready to retire in Malaysia? Get started now at passports.io/malaysia. Malaysia is a considerably cheap country for a standard pace of life. Currently, in crowded Kuala Lumpur, renting a two-story house in suburban neighborhoods would cost about USD 700 per month and a three-bedroom condo for USD 400-500. In the downtown, a three-bedroom condominium would cost more than USD 1000 per month. In other metropolitan area cities like Petaling Jaya, prices are 20-30% more affordable. If you intend to buy, in the center, the square meter starts from USD 2,500-3,000. On the outskirts, the price can be reduced by up to 50%. One of the preferred destinations for expatriates is Georgetown, on the island of Penang. Located to the northwest of the country, 120 km from its border with Thailand. It is undoubtedly one of the cities that offers the best quality of life. 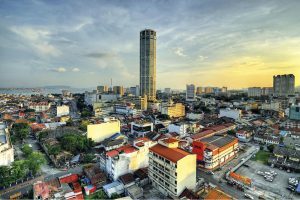 With the same facilities and amenities that you could find in KL, Penang is much less traveled and the colonial atmosphere makes it very charming. In addition, its proximity to rural areas makes it an interesting destination for trips and excursions. It is more affordable, a three-bedroom condominium in the center would cost about 600-700 USD and the price per square meter not much more than USD 1,600. Outside the center and the most tourist area prices can be 20-30% lower. Another destination with a large expat community in Malacca, where prices are slightly lower than Penang. Basic utilities would cost on average around USD 60. An internet connection of 10mbps would go for another USD 40. On the groceries expenses. In Malaysia, local products are very affordable but import products such as cheese are terribly expensive. Alcohol has a very high tax burden, being more expensive than in the West. A basic monthly food basket could cost around USD 100-150 per person. A meal at any local market or restaurant is very affordable, between USD 3-5. And in a mid-range restaurant for USD 10-15. As we have already mentioned alcohol is expensive, so if you are a nightlife lover, you should include a few hundred dollars more to your monthly budget. In a pub, a pint will not go down USD 3-4 and in the supermarket, a beer can cost between USD 2 and USD 2.50. Do not expect to find a bottle of low-end wine for less than USD 13-15. Getting around by car is not expensive in Malaysia. Malaysia is an oil producer country, and although since 2014 prices have fluctuated according to international prices, gasoline is still affordable. Currently, the liter of gasoline 95 in any dispenser costs around USD 0.50. However, Kuala Lumpur has an extensive and efficient public transport network, including several railway lines and a bus network. The average price of the trip is less than one dollar. The state rail network covers 11 of the 13 Malaysian states. Kuala Lumpur Airport is an international hub, connected to most major cities worldwide. The public health system in Malaysia is among the best in the region. However, under the program, you will not have access to it. Private healthcare is also high quality, but it is not excessively cheap. For a person of about 60 years, the most basic private health insurance will cost about 130 USD per month. Finally, to have an average standard of living, the minimum monthly income recommended for living in Kuala Lumpur would be USD 2,200-2,500. In cities like Georgetown or Malacca, about USD 1,500. To be considered a resident for tax purposes you must be in Malaysia more than 182 days per year. Income generated abroad by an individual is not taxable. Real Estate Capital gains are taxed at 5% if the transferred property was purchased more than 5 years earlier, 15% 4-5 years, 20% 3-4 years and 30% less than 3 years. There is a local property tax, which is 6% in the value of the annual rent, according to the assessment of the local authorities. Goods and Services Tax (GST) is 6%. You can consult Malaysia’s corporate tax scheme and tax treaties at incorporations.io/malaysia. Do you want to know more about Malaysia? The Philippines is synonymous with emerald rice fields, Spanish colonial cities like Vigan, frantic megalopoleis such as Davao, Cebu or Manila, colorful jeepneys, ancient Sagada Excavated Tombs, impetuous volcanoes of the Pacific Ring of Fire, endless islands and haven beaches such as Boracay and Dumaguete. Everything softened by the always smiling and carefree pinoys. Its more than 7,000 islands are a claim for those who want to retire with a relaxed and refreshing lifestyle, between turquoise waters and verdant tropical rainforests. English is widely spoken among its inhabitants. The population is predominantly Catholic, rara avis in Southeast Asia, so do not be surprised to cross with baroque churches. For those seeking beaches, beautiful landscapes, tropical climate, seafood and charming people, Philippines may be one of the world’s best countries to retire. Deposit of USD 20,000 at a Philippine financial institution, which must be maintained until the cancellation of the visa. From 35 to 49 years: deposit of USD 50,000 in a Philippine financial institution. 50 years or more with a pension of at least USD 800 per month or USD 1,000 for couples: deposit of USD 10,000 at a Philippine financial institution. 50 years or more without pension: deposit of USD 20,000 at a Philippine financial institution. The deposit may be used to purchase a ready for use real estate. As long as the minimum investment is USD 50,000. Certificate showing a pre-existing medical condition to be considered an ailing retiree. Deposit of USD 10,000 in a financial institution, which must be maintained until the cancellation of the visa. Monthly pension of at least USD 1,500. The program includes two dependents (spouse and child). An additional deposit of USD 15,000 will be required for each additional dependent. SRRV Human touch includes only one dependent. Deposits may be converted to Philippine Peso (PHP) after 30 days of visa issuance. Deposits should be made at one of the following financial institutions: Development Bank of the Philippines (DBP), Allied Bank, Philippine National Bank (PNB), Pacific Star Branch Only, Bank of China, Korea Exchange Bank, Tong Yang Bank and Unionbank. Other requirements include valid passport with a tourist visa in the Philippines, medical certificate, police clearance certificate and proof of relationship with dependents. The procedure takes approximately 10 days. Application fees are USD 1,400 and USD 300 for each dependent. It will be issued an ID card for USD 10 which is must to renew annually, paying an annual fee of USD 360. The annual fee covers three people, for each additional dependent a fee of USD 100 will be added. Under the program, the visa holder will be able to work in the Philippines, as long as he or she gets an Alien Employment Permit (AEP). 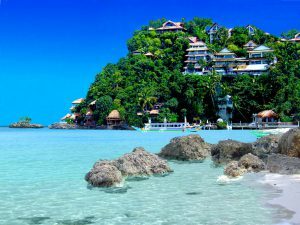 Willing to pack to retire in the Philippines? Start now at passports.io/philippines. The Philippines is one of the places where retirees can get more out of their pension. With USD 2,500 a month, a couple can have a considerable pace of life. One of the expats’ most popular cities in Cebu. A great metropolis half an hour from the beach. In Cebu, you can rent a three-room condominium in the city center for just over USD 700-800. In Manila, the capital, the rents are somewhat more expensive, so the same centric condominium would cost about USD 1,000-1,200 a month. Davao is much cheaper, an apartment in the center would not exceed USD 500 a month. Anyway, it is possible to find condominiums outside the city center for USD 300-400 per month. And if you move to a few km away you can find two-story houses for the modest price of USD 300. If you want a nice villa with pool and garage in front of the beach you can get it from USD 1,300 per month. Foreigners cannot buy land in the Philippines, but they can buy condominiums. In the downtown of Manila and Cebu the square meter would cost around USD 1,700-1900. Out of the center prices are much lower, around USD 1,000. Electricity is not particularly cheap. For a 85 square meters condo, monthly expenses on utilities could be USD 100. A 10 Mbps internet connection about USD 50. Hiring a full-time cleaning or gardening service will not cost more than USD 300 monthly. With regard to food, this is a little bit more expensive than in other countries of Southeast Asia. The monthly basic purchase for a person could cost USD 150, but it will always depend on the number of imported products, which can considerably increase the budget. Eating out is cheap. In a street market, you can eat for USD 2-3 and in a mid-range restaurant for about USD 7-8. Entertainment is affordable, especially alcohol, for less than USD 1 you can have a beer in a pub and go to the cinema for USD 3. In addition, you can enjoy two hours of massage for less than USD 10. Getting around the Philippine cities is very affordable but maddening. A journey with a jeepney or a scooter taxi is low-priced. In addition, the km of a conventional taxi costs USD 0.25, but foreigners should be aware of it if they don’t want to be a scam. In Metro Manila, there are four intracity train lines, definitely not enough for such a big Metropolis. The health system in the Philippines is acceptable. A full coverage medical insurance for a person over 60 may be expensive, up to USD 200. But the paying the costs of each clinic visit are considerably affordable. Although residents ‘worldwide income is subject to the Personal Income Tax, SRRV holders’ pensions and annuities are exempt from tax. The Philippines has treaties to avoid double taxation with more than 40 countries. Further information at incorporations.io/philippines. In addition, under the program, retirees will be exempt from customs duty on the importation of their personal effects, with a total maximum value and USD 7,000. Interest generated by foreign currency deposits will be tax-free. If converted to PHP they will be subject to a 20% withholding rate. Do you want to know more about the Philippines? Read our article about Taxes, Business and Fun in the Philippines. Few countries can boast of offering as much diversity, possibilities and options as there are in Thailand. A favorite destination for those living on a budget, but also for those who live without checking the bank statement. For those who want to relax on the pristine beaches of the Andaman Sea or the Gulf of Thailand. Of those who prefer living surrounded by the northern mountains, as the charming Chiang Mai. Or those who prefer the bustle of the bubbling streets of the frenzied all-in-one Bangkok. And also, for those looking for the vice and the neon lights of places like Pattaya. Tropical balmy climate, take the breath away natural landscapes, dream islands, majestic mountains, tropical rainforest, colorful temples, an impressive variety of food, authentic places, busy outdoor markets, endless shopping malls, massages, crazy nightlife, monkeys and elephants. All this enlivened by the local people, who know how to enjoy the moment like no one does. In addition, it is one of the safest countries in the region. Together with an excellent private healthcare system, makes Thailand one of the world’s best countries to retire, and if that is the top Asian destination among expat retirees. Visa policy in Thailand is daunting. As if they kicked you out of the restaurant when you have not even tried the starter. But for retirees, there seems to be an opened small window, through which some air enters the unsealing Thai visa room. To retire in Thailand an individual may apply for a Non-immigrant O-A (Long Stay) visa, which allows the stay for 1 year, renewable annually. Visa must be applied at the embassy or consulate in applicant’s country of residence. One of the following requirements must be met. THB 800,000 (≈ USD 23,000) in a combination of a bank deposit and annual income or pension. The minimum age for qualifying the Non-immigrant O-A visa is 50 years. The visa fee is THB 5,000 (≈ USD 140). Other requirements include the absence of a criminal record in both Thailand and residence country, medical certificate, and a marriage certificate (if applicable). This type of visa is individual and cannot include dependents. If the companion does not meet the requirements for a Non-immigrant O-A (Long stay) visa, he or she can opt for a Non-immigrant O visa (short stay). This single-entry visa will allow the dependent to stay in Thailand for a period of 3 months, renewable up to 1 year. Every 90 days, the visa holder must inform the immigration office of his/her address. This visa does not allow to engage in any kind of work in Thailand. Elite Ultimate Privilege Membership: Renewable 5-year multiple entry visa with the extendable 1-year length of stay per each entry. Membership validity of 20 years’. Membership fee: THB 2m (≈ USD 57,000) (excluding V.A.T.). Annual fee: THB 20,000 (≈ USD 570) (excluding V.A.T.). Elite Family Premium Membership: For Elite Visa holder’s dependents. Renewable 5-year multiple entry visa with extendable 1-year length of stay per each entry. Membership validity subject to the validity of the core member. Membership fee: THB 1m (≈ USD 28,500) (including V.A.T.). Annual fee: THB 10,000 (≈ USD 285) (including V.A.T.). Elite Property Partnership Membership: Renewable 5-year multiple entry visa with an extendable 1-year length of stay per each entry. Membership validity of 20 years’, provided that the applicant has bought property in cooperation with a Thailand Elite authorized agent. Membership fee: THB 1m (≈ USD 28,500) (excluding V.A.T.). Elite Easy Access Membership: Renewable 5-year multiple entry visa with an extendable 1-year length of stay per each entry. Membership validity of 5 years’. Membership fee: THB 500,000 (≈ USD 14,250) (including V.A.T.). The program includes benefits as premium services in Thai airports, limousine transportation, golf, spa, health checkup, duty-free benefits and special discounts at hotels, dining establishments and shopping malls. Is Thailand your retirement haven? Get started now at passports.io/thailand. The cost of living in Thailand is relatively low, but options for squandering are not lacking. About the rental price. In Bangkok, there is considerable contrast depending on the area. A three-bedroom condominium in the most centrally located areas can easily cost more than USD 2,500 per month. On the other hand, in a middle-class neighborhood or just a few km away from the center can cost around USD 400-500. In peripheral neighborhoods or in localities of the metropolitan area you can find more than 100 sq. m. houses from USD 400, and a modern condominium from USD 300 per month. Under the Condominium Act, foreigners are allowed to purchase condominiums. Prices in downtown Bangkok vary from USD 3,000-3,500 per square meter to USD 1,000 per square meter on the outskirts. Other locations with large expatriate communities are Pattaya, Hua Hin, Phuket, Krabi and Chiang Mai. In Pattaya, the closest beach area to the capital, rental prices are slightly lower than in downtown Bangkok. Being able to find 100 sqm. houses with a garden and swimming pool for USD 1,200 per month. A beachfront three-bedroom condominium would cost about USD 700 per month. The same goes for Hua Hin, a coastal town that has one of the largest expat retiree communities in the country along with Chiang Mai. Phuket is one of the most expensive places in the country. Although the rental prices are similar to those of Pattaya or Hua Hin. The cost of living is generally higher. On the other hand, we have Chiang Mai and Krabi, two much cheaper destinations, especially the first. On average rentals in Chiang Mai are 50% cheaper than in Bangkok. 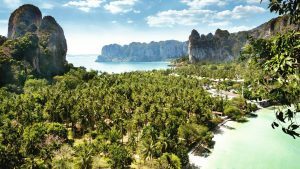 In Krabi, you can find real bargains, chalets 10 km away from the beach for USD 300-400 per month, but prices increase the closer they are to the beach and tourist areas. In Bangkok, the monthly utility expense for a two-person apartment may be around USD 100 per month. Upcountry can be up to 50% cheaper. With regard to foodstuffs, there is a price disparity. In general, certain fruits, vegetables and dairy products are usually slightly more expensive than in South Europe. Animal-derived products such as eggs, pork and especially chicken tend to be much more affordable. For an average person with USD 100, a week should be enough to fill the refrigerator. But everything will depend. Import products are expensive. Buying in local markets may reduce your budget by 20-30%. Grocery prices in more wealthy areas can be 20-30% more expensive. Even large distributors do not sell at the same prices in all areas. Moving around Bangkok is complicated. It is one of the worst traffic cities worldwide and public transport is deficient. There are two Skytrain lines and two subway lines for the entire metropolitan area. Not enough. Expats are usually concentrated in the areas closest to the stations. The average price of the trip is USD 1. There are many bus lines and songtaews (adapted pickups), which are very cheap, a trip does not exceed USD 0.30. You can also travel by taxis (less than USD 0.20 per km), tuk-tuks (more expensive and tourist-oriented), or with taxi scooters. However, when traveling with a vehicle you run the risk of staying hours in any of its endless traffic jams. In most upcountry locations, intracity public transport is very poor or almost non-existent, so you need to have a car or a motorbike. On the other hand, intercity transport is so convenient, as Thailand has a large number of airports and airlines’ fares are considered affordable. With regard to eating outside, leisure and entertainment, there is an offer for all budget levels. From a dinner at a street stall for USD 1-2 to high-end restaurants for over USD 300 per person. A beer can cost you USD 1.5 in a local pub or USD 10 at some Rooftop Sky bar. The Thai public health system is very cheap, but in many areas extremely improbable. Private health care is of high quality, with an affordable and abundant insurance supply. The retirement visa does not include any tax benefits. According to the Thai tax law, anyone living in Thailand for more than 183 days is a tax resident. Tax residents foreign-source income transferred to Thailand in the same year are subject to personal income tax. Savings or lump sums may not be taxable, but pension income may be. Capital gains and rental income or interests are also subject to Income Tax. The tax rate is progressive up to 35%. If the taxpayer proves that his income has already been taxed at the source or a tax treaty apply, it may be exempt from income tax payment. To pay taxes you must ask for a tax identification number. De facto, it is seldom asked and Thai taxman rarely investigates because it is assumed that the pension already pays taxes at source. You may do it, but you assume a risk. Learn more about Thai corporate tax scheme and tax treaties at incorporations.io/thailand. Panama is becoming the destination par excellence of American retirees. Location, beaches, sunshine, low cost of living, cheap and good health care, an attractive tax regime and ease of residence, with several benefits, are some of the reasons. Keep reading. 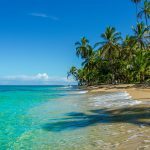 If you wish to retire in Panama, you may apply for the so-called Pensionado Visa. With which you will obtain permanent legal residence in Panama. To qualify for the program you must have a lifetime income of at least USD 1,000 per month. USD 1,250 for a couple and an additional USD 250 for each dependent. If you purchase a property in Panama worth USD 100,000, the minimum lifetime income required will be USD 750 per month. A one-time exemption from import duties of household goods up to a maximum total value of US $ 10,000. 100% exemption from customs duties for the importation of a vehicle every two years. 50% discount on entertainment events, such as movies, concerts or sports. 25% discount on certain airline tickets. 1% less on mortgages for a personal residence home. Start immigrating to Panama applying now at passports.io/panama. There is a considerable contrast between the capital, Panama City and rural areas. Panama City, is an urban development center, with all facilities at hand, but very crowded and more expensive. There are offers for all rental levels, from a beachfront house in Clayton for more than USD 8,000 to a one-room apartment in the suburbs for USD 700. For three-person apartment utilities, including the internet, would add up USD 100-150 monthly. If you are thinking of buying, the square meter in a downtown neighborhood in Panama City would cost around USD 2,200 while in the suburbs about USD 1,400. Considering that the average salary of a Panamanian is USD 700, with a monthly income of USD 1,800-2,000 you can lead a comfortable carefree life, but without great luxuries. The monthly food expenditure could be USD 150, buying the essentials. Regarding transport, there is the metro and Metrobus, for USD 0.25 and 0.35 per way, respectively. You can also go by taxi for USD 2 per km. As for leisure and eating out, an average meal for two people can be around USD 30-40. A beer in a pub USD 1.50 and watch a film in the cinema about USD 6. Health insurance would range from an annual amount of USD 100, the most basic, to USD 800, the most complete. 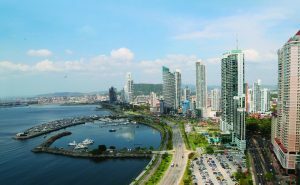 We have written about how to get residency in Panama. Tropical breezes, pristine white sand beaches, turquoise waters, coral atolls, the second longest reef in the world, fishing, diving, swimming, nature parks, hiking, rain-forest, Mayan ruins, few cars … and casinos. Located between Mexico and Guatemala, with a population that barely exceeds 230,000 inhabitants and English as an official language. Belize is extremely attractive to those looking for luxury, tranquility and relaxation. If you are looking for big malls or nightly entertainment, definitely Belize is not for you. Being an English-speaking country and its proximity to the United States, Belize has a remarkable community of American and British expats. If you want to retire in Belize, you must apply to the Belize Tourism Board for the Qualified Retired Person Incentive Program (QPR). To qualify for the program, you must be aged 45 or older and must prove a foreign source pension or annuity or another acceptable source of income of at least USD 2,000 per month. It is required to sign a commitment to transfer the aforementioned income into a bank, credit union or any financial institution in Belize. With the program, you will get the residence, which must be renewed every December 31st. You must meet the required requirements every year and remain in the country a consecutive period of 30 days per year. The program allows the inclusion of dependents. Other benefits of the program include a full exemption from customs duties for the first year on importing household and personal effects, a ship, an aircraft and a vehicle every three years. 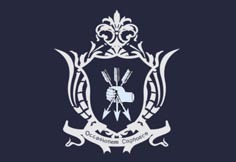 With the QPR card, you will not be able to work for a company in Belize, but you can keep your companies abroad, work online or for clients from abroad. The cost of the program is USD 1,000 for the main applicant and USD 750 for each dependent. In addition to a non-returnable application fee of USD 150 and a fee for the issuance of the QPR card of USD 200. The annual renewal fee of BZD 50. 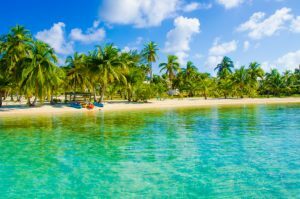 Wish to retire in Belize? Get started applying now at passports.io/belize. The largest expat communities in Belize are in the coastal districts of Ambergris Caye, Corozal, Belize City, and Placencia. Ambergris Caye is the most luxurious area, where you can find spectacular beachfront villas from USD 4,000 per month. Although there are inland options about USD 1,500. Corazol Town is more affordable, for about USD 800-100 you can rent a nice house with a garden. In Belize City, the most populous city, you can find everything. From villas for more than USD 3000 a month up to three-bedroom apartments for USD 600. In Placencia for USD 2,000-3,000, you can rent a two-bedroom beach house and a condominium for USD 1,000-1,500. If you contemplate the possibility of buying a property, a villain Corozal Town could cost more than USD 500,000. In Ambergris Caye, a two to the four-bedroom beachfront house are over USD 1m. A condominium with ocean views would cost around USD 500,000. In these two districts, 95% of the buyers are foreigners. Inland houses are considerably cheaper, about USD 200,000. In the south of the country, prices have increased a lot in recent years, but they are still more affordable. A beachfront condominium in Placencia would cost USD 350,000. The cost of utilities such as electricity, water, and waste can cost an average of USD 100. Internet connection is expensive, a 10MB broadband would cost around USD 120. Have a cleaning service or a gardener, would cost about USD 2-3 an hour. The food is sensibly affordable. With USD 200 per month, you should have enough. With another USD 200-400 a month, you can have a quite entertaining life. A dinner for two in an average restaurant would cost about USD 30. Although there are local restaurants and open-air markets that you can eat for less than USD 5. Regarding transportation, a regular bus from Belize City to Corazol (2 and a half hours) would cost about USD 4.5. The taxi is sensibly expensive, every km costs USD 2.50. In Belize healthcare in public hospitals is affordable, but suffers from a shortage of personnel, equipment and medications, especially outside of Belize City. Private family insurance with basic coverage could cost around USD 200 per month. In Belize, income earned abroad is not subject to personal income tax. More information about Belize tax scheme and tax treaties at incorporations.io/belize. If you want to learn more, read our Belize articles here. 264 sq. Km of islands between Cuba and Jamaica. 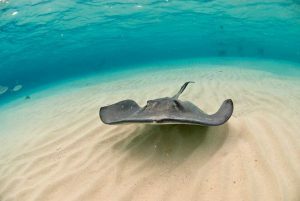 The Cayman Islands is an archipelago formed by three islands bathed by a turquoise sea. The Cayman Islands promise a high-standing retirement. In addition, it is known for being the capital of Caribbean gastronomy. Seafood risotto, octopus with spicy sauce, lobster, crab, and a mix of Spanish and Mexican food. Tax-Free, English-speaking population and safety, are other incentives to retire there. For those seeking luxury, Cayman Islands may be one of the world’s best countries to retire. Individuals who wish to retire in the Cayman Islands should apply for the Residency Certificate for Persons of Independent Means (R2). Minimum income and investment in the territory are required to qualify the program. The amounts vary if you intend to reside in Grand Cayman or Cayman Brac or Little Cayman. Proof of a continuous income source equal to or greater than KYD 120,000 (USD 98,400) per year. Have invested KYD 500,000 (USD 410,000) on the island, of which KYD 250,000 (USD 205,000) must have been invested in the developed residential real estate. Deposits or savings accounts are not considered investments for this purpose. Proof a continuous income source equal to or greater than KYD 75,000 (USD 61,500) per year. Have invested KYD 250,000 (USD 205,000) on the island, of which KYD 125,000 (USD 102,500) must have been invested in the developed residential real estate. Deposits or savings accounts are not considered investments for this purpose. In addition, the applicant must not have serious criminal convictions, be in good health and have adequate health insurance coverage. Once the requirements are proven and the application is approved, the applicant will be granted a residence certificate (R2). Valid for 25 years and renewable at the discretion of the Chief Immigration Officer. With the certificate, the holder can reside in the Cayman Islands without the right to work. Dependent people can be included in the program. The cost of the program is KYD 500 (USD 410) per application and KYD 20,000 (USD 16,400) for the certificate issuance. For each dependent, there is a KYD 1,000 (USD 820) fee. An individual can also apply for permanent residence, valid for life, by applying for the Certificate of Permanent Residence for Persons of Independent Means. In this case, it is required to prove annual income and own developed real estate of KYD 1.6m value (USD 1.3m). Start your retirement in the Cayman Islands at passports.io/cayman-islands. The Cayman Islands is the Caribbean country with the highest standard of living. And also one of the most expensive in the world. Statistics indicate that this is on average 80% more expensive than in the United States, not counting the rent, which is 40% more expensive. Most commodities are imported and they face a duty rate of 22-27%. The rent price for villas at the first line of coast does not lower of USD 4,000 and inland of USD 1,800. A three-bedroom apartment in the center of George Town costs about USD 3,000 and in the suburbs about USD 2,000. Electricity and water may be more than USD 300 per month. The internet connection costs about 80 USD per month. Gastronomy is one of the claims of the Islands but is made pay. A dinner in a mid-range restaurant for two would cost around USD 80 and a half liter draft beer in a pub around USD 3.50. Cooking at home is also expensive. As I have already mentioned, most basic food products are imported and subject to tariffs. So at least, the monthly supermarket budget can be USD 400 per person. In the Cayman Islands, you’ll need a car to get around. You can also take the bus for USD 1.80 the way or a taxi for USD 4 a km. About health, the Cayman Islands enjoys a modern and effective health system. It has four large hospitals, two of them public. With a ratio of 1 bed for every 25 inhabitants. In addition to an endless number of private specialized clinics. The cost of a basic health insurance can be USD 150-200 per month. Stamp duty on the lease of the property from 5 to 20% of the annual average rent. Stamp duty on the lease of a land, 5% of the value of the property if the term is more than 30 years, or 5% of the average annual rent if less than 30 years. Stamp duty on the transfer of a property of 7.50% of the value of this. Import duty tariffs between 22% and 27%. For lovers of nature and tranquility, Ecuador may be one of the world’s best countries to retire. Considered the most biodiverse country in the world. Divided by the volcanic mountain range of the Andes. The climate is tropical on the coast and cooler in the mountainous zone. Affordable cost of living, charming people, a good healthcare system, healthy and varied gastronomy, beaches, mountains, and jungle. It is straightforward to get a residency permit and may be one of the places where you can make the most of your pension. In addition, it is one of the safest countries in Latin America. Previously, in Ecuador, there was a Pensioner Visa. Following the entry into force of the new human mobility law, residence visas have been reduced to two. Temporary and permanent. If you wish to retire in Ecuador, you must first apply for a temporary residence visa. Justifying that you have an income equal to or higher than USD 800. After two years, you must apply for the visa renewal for two more years. In the first year of the visa extension, you should apply for a permanent resident visa or citizenship. You cannot leave the country more than 90 days per year during the temporary visa and must remain more than half of the year in Ecuador during the first two years of a permanent visa. More details here. Have you decided on Ecuador as your retirement destination? You can start your immigration process at passports.io/ecuador. 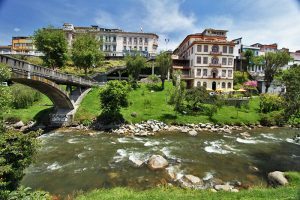 Ecuador is one of the countries where you make the most of your pension. In cities, such as Quito or Guayaquil, with USD 1,500-1,800 a month you can have a considerably high pace of life. 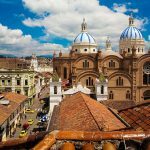 In Cuenca, it is even more affordable. In rural areas with USD 1,000 would be enough to have a quiet and carefree life. In the two large cities living in a centric 3-bedroom apartment would cost about USD 700 a month, with utilities and internet included. In rural areas, you can find family homes for as little as USD 300. If you prefer to buy, real estate in Ecuador is the cheapest in Latin America. In the cities, the average price of the square meter oscillates between USD 1,100-1400. Considerably lower in rural areas. The monthly expenditure on food could be around USD 100-120 per person. You can go out to dinner at a good restaurant for about USD 15. As for transport, in addition to being cheap (a monthly pass costs USD 10), retirees enjoy multiple discounts. The taxi is also cheap, a km costs USD 0.40. As a resident, you may choose to apply for membership in the Ecuadorian public social security system. In any case, private insurance is affordable. You can find health insurance with full coverage for USD 50-70 per month. If you justify that your income is already paying taxes in your home country or in any other country, you may be exempt from paying personal income tax in Ecuador. If not, you will have to face a progressive tax up to 35%. Know more about Ecuador taxes here. Take a walk around coastal towns like Casapueblo, make us feel like we are in Santorini or any gorgeous Greek, Italian or Spanish Mediterranean town. 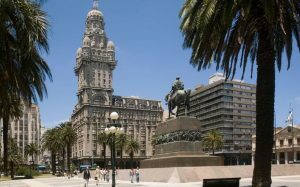 Strolling around Montevideo and observing its architecture, squares, cafes, will give us the feeling of being in any historic city in southern Europe. But Uruguay is much more, for lovers of the beach, luxury, fun, nightlife, you can go to spend the summertime in Punta del Este, the entertainment capital of South America. Those looking for tranquility enjoying an asado and a thermos of mate, can stay in any of the villages of the 600 km of immaculate Atlantic beach. Or in the La Plata river shore, with its meadows dotted with palm trees. If prefer an urban life, Montevideo offers the same comforts as any western city. As it is considered the capital of South America with the best life quality, and it is one of the most modern and civilized cities in the whole continent. An individual who wants to retire in Uruguay must apply for a permanent residence visa. The main requirement is to present to the Residency Department of the National Migration Directorate a notarized certificate of the pensioner status and the concept of income obtained abroad. In addition to a Health Card of Uruguay and a certificate of absence of criminal records. The fee to obtain the permit is of 2.71 UR (currently, approximately USD 2,609). During the first two years, the foreigner must request a re-entry permit if he wishes to leave the country. The foreign retirees in Uruguay can import goods of domestic use free of customs taxes. They will also be allowed to import a vehicle. As long as they receive a minimum income of USD 1,500 per month or have purchased a residential property of at least USD 100,000, which cannot be sold in a period of 10 years or have invested the same amount in Government bonds. Get started in your Uruguayan retirement through passports.io/uruguay. The cost of living in Uruguay is not exorbitant, but it is not cheap either. Montevideo offers a great quality of life, but it is also one of the most expensive metropolis of the continent. Having an acceptably comfortable life requires at least USD 2,500 a month, as we will see below. Renting a three-room apartment ranges from USD 400 to USD 1,300, depending on the area. It is common that when renting a flat, the landlord asks for 5-6 months in advance. If you want to buy, the square meter goes to more than USD 2,000. Outside the capital, prices are significantly cheaper. Basic utilities can rise to more than USD 200 per month, mainly for electricity, which is very expensive. The internet plus phone package can cost around USD 30. The monthly groceries shopping cart for two people without any excess would cost USD 200. Getting around by car is expensive in Uruguay. The high tax burden, the appreciation of the dollar and the high margins of the distributors make the gasoline expensive. Anyway, the country is well connected with a network of Omnibuses, from USD 1 the way or USD 40 the monthly pass. With regard to leisure, dining in a mid-range restaurant can cost around USD 25, a half-liter draft beer in a pub USD 2.50, and see a movie premiere about USD 9. It all depends, but we calculate an expense of at least USD 200-250 per month in entertainment. Health care is excellent in Uruguay, and a basic health insurance would cost USD 60-80 per month. Some imported products as electronics, are considerably expensive in Uruguay. Import taxes range from 0 to 35% with an average of 22.27%. Income earned abroad remitted to Uruguay is not subject to personal income tax. The property tax is between 0.25% and 1%. A place you can pay NO Taxes and get a 2nd passport… Keep reading about Uruguay here. 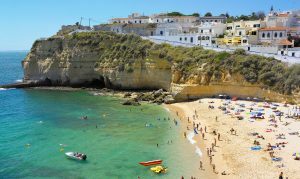 Portugal is one of the favorite retirement destinations for the North European, and it is being increasingly popular among Americans. Due to its retiree foreign income tax-free regime together with an enviable climate, beaches, open-air markets, good food, wine and an extensive knowledge of English. Portugal is a safe country, besides being under one of the best healthcare systems in the world. And at a considerably affordable price. The largest retirement expat communities in Portugal are located mainly in Lisbon, Algarve, Cascais, and Guimarães. If you are a European wishing to retire abroad, but not so far from your home, Portugal may be one of Europe’s best countries to retire. To retire in Portugal, the main requirement is having a monthly income of at least EUR 1,000. Non-EU citizens must apply for a category 1 resident visa at any Portuguese consulate or embassy. Upon arrival in the country, they must apply for a residence permit within six months. Renewable every two years. After the 5th they can obtain the permanent residence permit. There is also the option of the Golden Visa, which allows the residence for 5 years to foreigners who buy property worth EUR 500,000 or invest EUR 1,000,000 in a business or start a local business that creates at least 10 jobs. After 5 years, it is possible to apply for the permanent residence and after 6 for the citizenship. EU citizens, during the first 30 days of stay, must apply for a residence permit that will be valid for a period of 5 years. After which they can apply for a permanent residence permit. If you are willing to retire in Portugal, apply now at passports.io/portugal. Portugal is one of the most affordable Western Europe countries. With USD 1,500-2,000 a month you can live without great luxuries, but pleasantly. In the Algarve, renting a detached house would cost between USD 600 and USD 1,000. In Lisbon, the rent for a standard apartment would be around USD 800-1,000. There are cheaper options from USD 300, but in less touristy and in rural areas. The basic utilities in an apartment of 85 m2 would cost around EUR 85 per month. The real estate market offers great opportunities. Being one of the most affordable in the EU-15. The average price of the square m. in Lisbon and the Algarve is approximately EUR 2,500 and EUR 2,000, respectively. In addition, rental yields are acceptable, from 5-6% in Lisbon and 3-4% in the Algarve. Non-EU nationals must have a health insurance, which costs around USD 100-250 per month, depending on the coverage. The healthcare system is considered one of the best in the world. The price of food is considerably cheap compared to other European countries. With a monthly budget of EUR 150-200 should be enough. With regard to transportation, 1 km by taxi in Lisbon costs EUR 0.47, starting at EUR 3.50. A bus or subway ticket is EUR 1.60, and the monthly pass is EUR 36. Retirement is to enjoy it, and in Portugal comes at a good price. A meal in a local restaurant costs between EUR 8-10 and a mid-level restaurant dinner about EUR 15. After dinner, you can have a pint of beer in a pub in Lisbon for a modest price of EUR 1.50. If you obtain the non-habitual resident (NHR) status and have not resided in Portugal during the previous five tax years, foreign-source pensions, dividends, royalties and interests income will be exempt from tax during the first 10 years. To apply for the Non-Habitual Resident (NHR) status, you must reside 183 days in the year of application and subsequent years. If you are not a tax resident in your home country, and it has a tax treaty with Portugal, your pension might be totally tax-free. Check incorporations.io/portugal to learn more about its tax treaties. This island of the eastern end of the Mediterranean has been for decades the destination chosen by many Central European and especially British pensioners to retire. Due to the relatively low cost of living, favorable tax conditions and an English-speaking population. In addition, the island enjoys tranquility, the absence of congested areas and a healthy Mediterranean lifestyle. Good weather, nice beaches, mountain, and extremely friendly people. Another of the great advantages of Cyprus, being a former British colony, its population has a high knowledge of English. Individuals who want to retire in Cyprus should apply for a permanent F category residence visa. The application must be made in the Department of Civil Registry and Migration in Cyprus or in the Immigration district branches or at any Cyprus Embassy or Consulate. To qualify for the visa, it must be proved a minimum regular annual income of EUR 9,568.17, and EUR 4,613.22 for each dependent, but the Immigration Control Board may demand additional amounts as necessary. The residence permit will be canceled if the holder gets permanent residence abroad or is absent from Cyprus for a period of two years. The residence permit F prohibits the holder from participating in any economic activity or work in Cyprus. 3 years term fixed deposit in a Cypriot bank of at least EUR 30,000, plus EUR 5,000 for each dependent. The fees for obtaining the residence permit are EUR 500 and are paid when submitting the application. 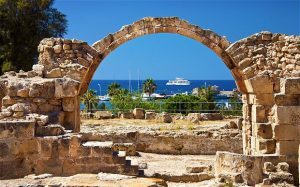 Do you want to get a Residence Permit in Cyprus? Apply now at passports.io/cyprus. Compared to most European countries, the living costs of Cyprus are considerably low. Especially housing and its related costs and health care. The average rent for a house with two rooms is around EUR 620. In the center of Nicosia, the most expensive area, renting a 3-room apartment would also be around EUR 600, while in the suburbs it would be EUR 300-350. The average price of the square meter in the center of Nicosia is EUR 1,500 approx. And on the outskirts of EUR 1,200. On average basic utilities, such as electricity, heating, water or rubbish would cost about EUR 116. The internet connection would cost about EUR 26 per month. EU citizens have free access to the public health system, which is reasonably efficient. For non-EU citizens, who are required to take out health insurance, these are not especially expensive. The price of food is slightly lower compared to the large European cities, especially the local seasonal fruit and meat. With regard to leisure and eating out, a standard restaurant meal is EUR 12, take a half-liter draft beer for EUR 3.50 and watch a film at the cinema for EUR 8. The price of a single bus ticket costs EUR 1.50 and taxis charge EUR 0.75 per km, starting at EUR 3.50. In Cyprus, there is no railway network but the bus network is wide and covers almost the whole territory. Another Cyprus’ incentive for retirees is its favorable tax environment. Pensions and other income from foreign sources are taxable at a 5% rate. Withdrawals from lump sum pensions can be entirely tax-free. In addition, Cyprus has concluded tax treaties with a long list of countries. You can consult these treaties at incorporations.io/cyprus. In this link, you can read an interview with a British expat living in Cyprus..
300 days a year of sunshine in the Mediterranean heart. Pristine beaches. A fascinating historical cultural heritage. One of the safest places in Europe. A relatively affordable cost of living and a favorable tax environment. English as the official language and a large expat community. There is no need to say that Malta is certainly one of the best places in Europe to spend the retirement years enjoying the Mediterranean lifestyle. Read here Why Malta should be your next European gateway. 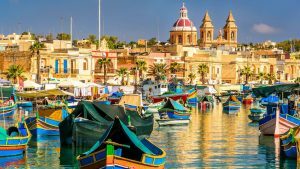 Malta has a Retirement Program (MRP) for EU, EEA or Swiss nationals wishing to spend their retirement years in the country. To qualify for this program, applicants must own/purchase and reside on a property worth EUR 275,000, or EUR 250,000 if the property is located in Gozo. They can also qualify for the program those who rent a property for an annual value of EUR 9,600, or EUR 8,750 if it is located in Gozo. In order to qualify for the program, the applicant must receive a pension, whether from employment, pension plan or insurance. Which has to constitutes 75% of the regular income. In addition, the applicant must reside an average of 90 days a year, in periods of 5 years, and not stay in another country more than 182 days a year. The program besides offering permanent residence also offers considerable tax advantages. Application fees are EUR 2,500. High Net Worth Individual Scheme: Requires owning a property in Malta with a value of at least EUR 400,000 or renting a property for an annual value of EUR 20,000. In addition to complying with minimum tax obligations. The cost of the application is EUR 6,000. (The EU, EEA and Swiss citizens may also qualify for this program). Global Residence Program Scheme: Requires owning a property in Malta worth at least EUR 275,000 or renting a property for an annual value of EUR 9,600. In addition to complying with minimum tax obligations. The cost of the application is EUR 6,000. (The US, EEA, and Swiss citizens cannot qualify for this program). With these programs, it is possible to get the EU resident card, so the holder can travel around the Schengen area without restrictions. Do you want to retire in Malta? Get started now at passports.io/malta. Despite being a super touristic island, the cost of living in Malta is considered affordable. A 1 bedroom apartment in the center of Valletta, the most expensive city, can cost around EUR 600. The monthly cost of utilities can amount to about EUR 80-90 on average. Groceries are considerably cheaper than in Europe capitals. Eating in a mid-level restaurant can cost around EUR 30 with a glass of wine included and have a beer in a pub around EUR 3. Another advantage of the island is its excellent transport system, so having a car is not necessary. Residence cardholders can access the public healthcare system of Malta. Malta Retirement Program (MRP): 15% of income from foreign sources, whether they are pensions from employment, pension funds or insurance. High Net Worth Individual Program: 15% of income from abroad. The minimum tax amount is EUR 20,000. If the minimum amount is not reached, income will be taxed at 35%. Global Residence Program: 15% of income earned abroad. The minimum tax amount is EUR 15,000. If the minimum amount is not reached, income will be taxed at 35%. Check Malta’s tax treaties at incorporations.io/malta. Do you want to learn more about Malta? Read our article about Passport in Malta. As we have seen, there are many options to make your retirement years, one of the best experiences of your life. Once you decide to retire abroad, choosing the country is a momentous decision. Location, cost of living, climate, environment, language, culture, entertainment, lifestyle, expat communities, top-class services, safety, excellent healthcare, and a tax-friendly environment are factors that should not be overlooked. At Flag Theory, we can help you with that. Reach out to us, and we’ll make sure you have all the information to make the best decision, make an optimized financial planning so that you can save money and make the most of your retirement, and support through the process of acquiring visas and residence permits. What are the cheapest countries to retire in? Ecuador is the country with the lowest cost of living, followed by Southeast Asian countries. What are the most tax-friendly countries to retire in? The Cayman Islands, followed by Belize, Panama, Malaysia, Philippines, and Portugal. None of these countries tax foreign-source income. What are the easiest retirement visas? Ecuador, Portugal, and Panama are the countries with the fewest requirements and the fastest process to obtain residence. Although requirements in Uruguay and Cyprus are not so demanding, it can take more than half a year to get the residence permit. What are the safest countries to retire in? Although all mentioned countries are considered safe, European countries, the Cayman Islands, Malaysia, and Thailand are the ones with the lowest crime rates. What countries have the best healthcare? Probably Portugal and the Cayman Islands. In Portugal, as a resident, you have the right to use its public healthcare system. In the Cayman Islands, private healthcare is premium but quite expensive. In what countries can I work with a retirement visa? As it is not a specific retirement visa, but a residence permit, Ecuador and Uruguay. In Malaysia, a retiree could work up to 20 hours per week in certain sectors or invest in a business, under the approval of the authorities. In Philippines retirement, visa let you work, as long as you apply for an Alien Employment Permit (AEP). What are the countries with the lowest real estate prices? Any specific question? Schedule a coaching call with us here. This article should not be construed as legal, tax or investment advice. Flag Theory has access to a global network of qualified attorneys and accountants who can give you the proper advice for your particular circumstances. Contact us for further information.